Cypress Provides Drilling Update at Clayton Valley Lithium Project in Nevada | Cypress Development Corp.
Vancouver, BC - Cypress Development Corp. (TSX-V: CYP) (OTCBB: CYDVF) (Frankfurt: C1Z1) (“Cypress” or the “Company”) has completed the first half of its fall 2017 drilling program on its Dean & Glory properties, located in Clayton Valley, Nevada. The fall 2017 program was planned for 12 to 14 drill holes, totaling up to 1500 meters of NQ-size core, to be divided between Cypress' contiguous Dean and Glory properties. The two properties cover an area totaling 4,220 acres and are 100 per cent controlled by Cypress. So far, in the fall program, the Company has completed five holes on the Dean property. These holes were drilled on two east-west fences, about one kilometer apart and with 400 meters between the holes. With this spacing, and another nine holes drilled earlier this year, the Company anticipates establishing several kilometers of continuous lithium mineralization across the property. All the core from these five holes has been logged, split and submitted to an assay laboratory for analysis. The Company expects to receive assay results later this month or in December. Geology and structure seen in all five holes are consistent with the drill results obtained on the Dean property earlier this year. To date, all of Cypress' drilling has been on the Dean property. Assays results from nine holes drilled earlier this year are summarized in the table below. All nine holes encountered significant lithium values within claystone, ranging up to 1,790 parts per million lithium (ppm) and averaging 900 ppm lithium (or 0.48 per cent lithium carbonate equivalent) throughout an average drill depth of 74 meters across all nine holes. This initial drilling on the Dean property covered an area of about four kilometers in length by two kilometers in width. The lateral limits of the area of lithium-bearing claystone are considered open in all directions. *Notes: ppm=parts per million, Avg=Average, m=meters, From is depth from surface. Cypress has now moved the drill rig onto the Glory property, immediately south of the Dean. The remainder of the drill program on Glory will consist of six to eight holes. Previous sampling on the Glory property identified lithium values in surface exposures ranging up to 3,800 ppm for over three kilometers south along trend from the adjoining Dean property. Cypress expects to extend the outline of the lithium-rich claystone seen in drilling southward into the Glory property. Cypress believes its claystone deposit in Clayton Valley, which is located due east of Albemarle’s Silver Peak lithium brine operation, has the potential to become a significant source of lithium. Cypress is very active in Nevada, with its geological team focused on systematically exploring its properties for lithium. In addition to the drilling in progress, Cypress is continuing with metallurgical studies to determine the exact nature and distribution of the lithium mineralization in the claystone with the goal of identifying a cost-effective means of extraction. Cypress is focused on the development of an economic process for extracting the lithium from its Clayton Valley deposit. 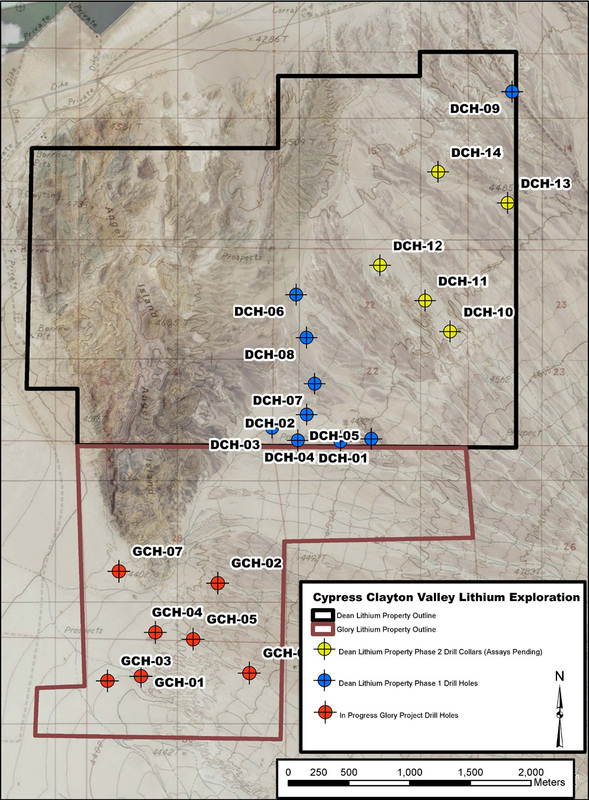 The geology of the Clayton Valley in Nevada is best summarized as being what is essential to have formed the largest lithium production center in North America. Lithium has been produced from surface and subsurface brines since 1967. Though other important contributions from other geologists have occurred over many years, Cypress is largely responsible for the realization that most of the lithium in the Clayton Valley remains untouched and appears to represent an important, potentially long term supply of lithium. This resource is not contained in brine, but in fact sits exposed at surface along the east margin of the basin. The Clayton Valley is a topographically closed basin, not a Valley. No water escapes the Clayton Valley except by evaporation. Evaporation has resulted in the trapping and concentration of lithium within the basin. The Clayton Valley has been undergoing tectonic subsidence for the last one million years. Volcanic ash from active volcanic vents in the region has accumulated to substantial thicknesses as the basin continually sags lower. This ash has settled into a layered sequence that is >1000 meters thick. The upper 100 to 200 meters of the ash rich stratigraphy are highly enriched in lithium, not solely in ground water aquifers, but also pervasively through the basin sediments themselves. The basin fill ash rich sediments are exposed at surface only along the east margin of the basin. The Cypress land position dominates this uplifted, well mineralized exposure. Based on the results of nearly two years of highly focused and efficient exploration of the outcropping, lithium rich stratigraphy, it is now clear that a significant volume of lithium has been discovered in the east Clayton Valley and that the amount of lithium so far discovered in the ash rich rocks is several orders of magnitude larger than the remaining lithium brine resources within the basin. Based on this, Cypress believes the future production of lithium from the basin will be dominated by mining of the uplifted, outcropping ash-rich basin-fill sediments. Robert Marvin, B.Sc., PGeo, VP of Exploration and Director of Cypress Development Corp., is the qualified person as defined by National Instrument 43-101 and has approved of the technical information in this release. Cypress Development Corp. has approx. 51.8 million shares issued and outstanding.